FRANKFURT -- Volkswagen Group's global vehicle sales rose 14.6 percent to 788,700 units in October as strong demand in the United States and China helped to offset a weak European market. The group's sales for the first 10 months are up 10.2 percent to 7.5 million. VW sales chief Christian Klingler warned that Europe's economic woes are a continuing cause for concern. "We again put in a strong performance in North America, China and also Russia. However, market uncertainty continues, particularly in western Europe," Klingler said in a statement on Friday. VW did not give a breakdown of sales by brands and markets for October. The automaker said 10-month sales in China, VW's largest single market, rose 19.6 percent to 2.26 million, while volume in the United States was up 33.5 percent to 481,100. In western Europe, excluding Germany, 10-month sales fell 5.8 percent to 1.57 million. In Germany, deliveries increased 3.5 percent to 994,500. In Russia, VW sales rose 46.7 percent to 262,200. All VW Group brands increased sales in the first ten months, except its Spanish unit Seat. Audi sales were up 12.9 percent to 1.22 million through October. Volume at the core VW brand increased by 11.2 percent to 4.72 million. Deliveries at Czech unit Skoda rose 7.2 percent to 795,100, while Seat's sales fell 9.8 percent to 265,200, as the brand continued to be hit by poor economic conditions in its key southern European markets. Porsche, which Volkswagen added to its brand portfolio in August, sold 34,500 units in the three months as a group brand, VW said. VW aims to pass General Motors Co. and Toyota Motor Corp. for the position of No. 1 global automaker by unit sales by 2018. VW is targeting 10 million auto sales that year. In 2011, VW Group sold 8.27 million units, behind GM with 9.05 million and ahead of Toyota with 7.95 million. The Volkswagen Group achieved a 10.2 percent increase in worldwide deliveries from January to October 2012, handing over 7.50 (January-October 2011: 6.80)* million vehicles to customers and thus delivering well over seven million units for the first time in this period. The Group recorded a 14.6 percent rise for the month of October, delivering 788,700 (October 2011: 688,000)* units. 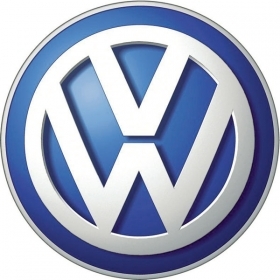 "The Volkswagen Group developed very well in October. We again put in a strong performance in North America, China and also Russia. However, market uncertainty continues, particularly in Western Europe", Group Board Member for Sales Christian Klingler said in Wolfsburg on Friday. Deliveries on the American continent continued to develop well with the number of vehicles handed over in the North America region from January to October growing 25.4 percent to 681,200 (543,000) units, of which 481,100 (360,400; +33.5 percent) were delivered in the United States. The Volkswagen Group handed over 842,200 (777,200; +8.4 percent) vehicles in South America during the same period, of which 644,000 (586,900; +9.7 percent) were delivered to Brazilian customers. The Group also recorded very satisfactory figures in the Asia-Pacific region, where 2.56 (2.15; +19.0 percent) million vehicles were delivered to customers in the period to October, of which 2.26 (1.89; +19.6 percent) million units were delivered in China, the region's largest single market. In India, deliveries grew 3.6 percent to 94,900 (91,700) vehicles. Group brands delivered 3.10 (3.07; +0.9 percent) million vehicles on the overall European market from January to October. As a result of the continued difficult market situation, Europe's largest automaker handed over 1.57 (1.67; -5.8 percent) vehicles to customers in Western Europe (excluding Germany). In the home market of Germany, the company grew deliveries to 994,500 (960,800; +3.5 percent). The Volkswagen Group continued to achieve growth in Central and Eastern Europe, where 534,600 (441,500; +21.1 percent) vehicles were handed over to customers, of which 262,200 (178,700; +46.7 percent) were delivered in Russia, the region's largest single market. The Volkswagen Passenger Cars brand delivered 4.72 (4.24; +11.2 percent) million vehicles to customers worldwide in the period to October. The brand developed particularly well in the Central and Eastern Europe region, where 223,100 (173,100; +28.9 percent) units were delivered. Volkswagen Passenger Cars handed over 508,500 (404,900; +25.6 percent) vehicles to customers in the North America region, while the figure was 1.89 (1.61; +17.4 percent) million for the Asia-Pacific region. Audi delivered 1.22 (1.08; +12.9 percent) million vehicles worldwide from January to October. The premium brand from Ingolstadt again performed well in North America, where customers took possession of 136,600 (116,100; +17.6 percent) new vehicles. In the Asia-Pacific region, Audi delivered 393,500 (305,100) vehicles during the same period, an increase of 29.0 percent. The sports car manufacturer Porsche, which became a Volkswagen Group brand on August 1, 2012, delivered a total of 34,500 vehicles from August to October. Demand for models built by the Stuttgart-based carmaker was particularly strong in the Asia-Pacific region, where 10,200 units were handed over, and in the North America region, where deliveries also ran at 10,000. The Skoda brand delivered a total of 795,100 (741,800; +7.2 percent) vehicles from January to October. The Czech automaker performed particularly well in Central and Eastern Europe, where 214,900 (188,000; +14.3 percent) units were handed over, and in the Asia-Pacific region, where 240,900 (218,600; +10.2 percent) vehicles were delivered. Seat delivered 265,200 (294,000; -9.8 percent) vehicles worldwide in the period to October, mainly as a result of the difficult market situation in Western Europe. The Spanish brand did, however, grow deliveries in Germany to 51,200 (44,900, +13.8 percent) units, in the UK, where 33,700 (31,100; +8.4 percent) vehicles were handed over to customers, and in Mexico, where 17,000 (14,200; +20.0 percent) vehicles were delivered. Volkswagen Commercial Vehicles grew deliveries 5.0 percent to 455,400 (433,700) units in the ten-month period. 103,600 (100,600; +3.0 percent) vehicles were handed over to customers in the home market of Germany. Deliveries to the rest of Europe also developed well. As a result, vehicle deliveries on the overall European market rose to 271,900 (263,500; +3.2 percent) units.